Elite Karate, Martial Arts and Fitness Centre is focused on serving the entire family. 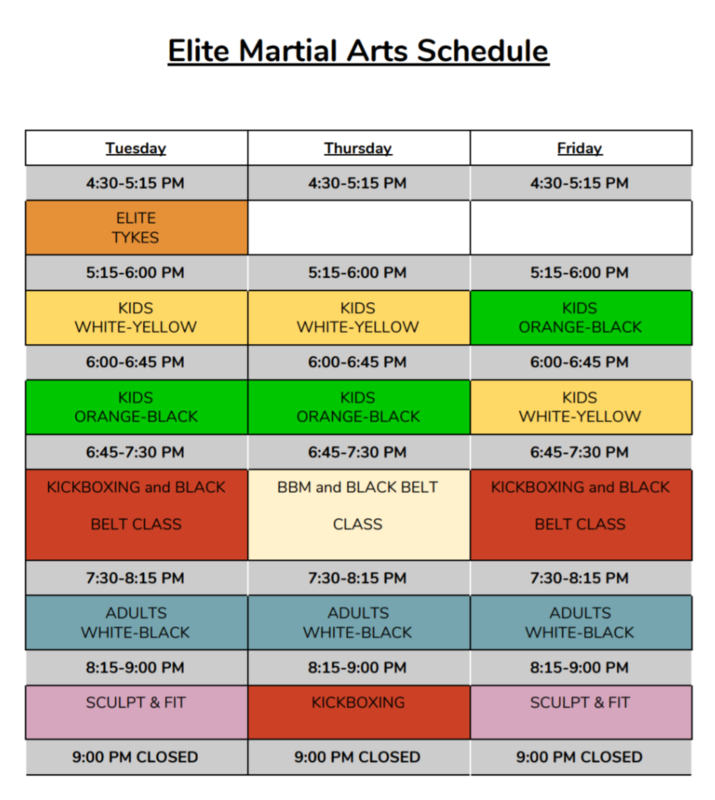 Elite offers specific classes geared towards certain age groups and belt levels. We offer children’s classes, adult classes, and even Elite Tykes classes for kids aged as young as 4 to 6 years old. All our children’s karate programs are designed to help students learn to be positive role models and to become the future leaders in our community. We teach them the importance of self-confidence; believing in ones self will allow the child the chance to obtain goals that they set for themselves, giving them “the yes I can attitude”. This is very important aspect of the child’s growth, which, in turn, is a very useful ally against bullying. We teach them about fitness, improving their cardiovascular and strength training, and helping them understand the benefits of being healthy. Our instructors will help the children learn the power of focus. Giving them good listening skills. We stress the importance of listening with their ears and watching with their eyes will help them comprehend and to improve on their skills. Respecting others and ones self is a valuable trait that we teach in every class (treat people as you want to be treated.) Discipline, and self-discipline are two essential behaviors that we teach our students. Making sure they understand that we all must follow rules and that we all are accountable of our own actions. “Every action creates a reaction”. Our students learn valuable street-smart evasion tactics with strong and quick self-defense techniques. We teach them how to identify a bad situation and how to get away with minimal violence and control. This special program is designed for 4, 5 and 6 year old children. We teach the children that exercising can be fun with energetic games that can also improve their coordination, balance, listening skills and respect for others. The basic street-smart self-defense tactics are taught in a safe, fun environment. Our adult programs will show you how to manage stress, lose weight and increase your flexibility. We stress the importance of a healthy lifestyle while you learn Self Defense and Personal Protection. At Elite Martial Arts, we believe that setting goals is essential for the progress of the student. Every student is motivated to achieve their goals by working hard and maintaining focus in class, as well as practicing at home. Karate is an art that requires lots of practice and repetitive movements. Proper practice is very important in comprehending the art of Karate. Through repetition, a student learns each technique instinctively. This allows the student to have a proper foundation for building new skills. All of our programs are structured to help every student regardless of their age, gender, or capability. At Elite Martial Arts we want the best results for our students. We teach with a passionate, caring approach so the students will learn this same attitude. In addition to this, we ask the students to follow the student creed that states, “My goal is to become the best person that I can be”. As instructors we feel it is imperative that our students believe in themselves in order to allow them to develop the ambition and confidence to achieve their goals.